Digital Design with CPLD Applications and VHDL uses programmable logic as the primary vehicle for instructing readers in the principles of digital design. More specifically, emphasis is on Complex Programmable Logic Devices (CPLDs) and the software tools used for their programming, with a decided shift away from fixed-function SSI and MSI devices. Immediately following discussion of digital fundamentals, Digital Design with CPLD Applications and VHDL introduces its readers to Complex Programmable Logic Devices. Ideal for a first course in digital electronics, yet comprehensive enough for use by students at the senior design project level and EET professionals, Digital Design with CPLD Applications and VHDL uses programmable logic as the primary vehicle for instructing readers in the principles of digital design. More specifically, emphasis is on Complex Programmable Logic Devices (CPLDs) and the software tools used for their programming, with a decided shift away from fixed-function SSI and MSI devices. Immediately following discussion of digital fundamentals (e.g., Boolean algebra, logic minimization, combinational and sequential circuits), Digital Design with CPLD Applications and VHDL introduces its readers to Complex Programmable Logic Devices (CPLDs). Subsequent chapters on the Altera MAX+PLUS II design environment, combinational logic functions, arithmetic circuits, latches and flip-flops, PLD architecture, counters and shift registers, and state machines are all based primarily on CPLDs and VHDL programming. By featuring VHDL and MAX+PLUS II applications throughout the book, readers are guaranteed exposure to this new digital paradigm as an integral part of their training, rather than as an optional add-on. 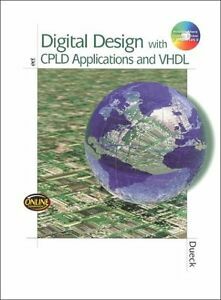 Digital Design with CPLD Applications and VHDL also includes a CD-ROM that provides the reader with a complete digital design and prototyping system that can be used at school...or at home. Included are graphic design files, VHDL files, plus all of the simulation files from the examples presented in the book. Readers may opt to run simulations or program CPLDs with these ready-to-use, error-free files. Or, they may choose to use the files as templates for their own modifications. This Second Edition continues to use programmable logic as the primary vehicle for teaching digital design principles, and maintains its cutting-edge status by updating to Altera's newest Quartus II software, the most current method of digital design implementation. This Windows-based software allows users to design, test, and program CPLD designs in text-based (VHDL) and graphic (schematic entry) formats. The Second Edition introduces CPLDs earlier in the teaching sequence, laying a solid foundation for more advanced principles without neglecting underlying digital fundamentals such as Boolean algebra, logic minimization, and combinational and sequential circuits. VHDL and Quartus II applications are provided throughout. Chapter 1 Basic Principles of Digital Systems: 1.1 Digital Logic Levels, 1.2 Binary and Hexadecimal Numbers, 1.3 Digital Waveforms. Chapter 2 Logic Functions, Switches and Gates: 2.1 Basic Logic Functions, 2.2 Logic Switches and LED Indicators, 2.3 Derived Logic Functions, 2.4 DeMorgan's Theorems and Gate Equivalence, 2.5 Enable and Inhibit Properties of Logic Gates, 2.6 Integrated Circuit Logic Gates. Chapter 3 Boolean Alegbra and Combinational Logic: 3.1 Boolean Expressions, Logic Diagrams and Truth Tables, 3.2 Sum-of-Products (SOP) and Product-of-Sums (POS) Forms, 3.3 Theorems of Boolean Algebra, 3.4 Simplifying SOP and POS Expressions, 3.5 Simplification by the Kamaugh Map Method. Chapter 4 Introduction to PLDs and MAX+PLUS II: 4.1 What is a PLD?, 4.2 Programming PLDs using MAX+PLUS II, 4.3 Graphic Design File, 4.4 Compiling MAX +PLUS II Files, 4.5 Hierarchical Design, 4.6 Text Design File (VHDL), 4.7 Creating A Physical Design. Chapter 5 Combinational Logic Functions: 5.1 Decoders, 5.2 Encoders, 5.3 Multiplexers, 5.4 Demultiplexers, 5.5 Magnitude Comparators, 5.6 Parity Generators and Checkers. Chapter 6 Digital Arithmetic and Arithmetic Circuits: 6.1 Digital Arithmetic, 6.2 Representing Signed Binary Numbers, 6.3 Signed Binary Arithmetic, 6.4 Hexadecimal Arithmetic, 6.5 Numeric and Alphanumeric Codes, 6.6 Binary Adders and subtractors, 6.7 BCD Adders, 6.8 Carry Generation in MAX+PLUS II. Chapter 7 Introduction to Sequential Logic: 7.1 Latches, 7.2 NAND/NOR Latches, 7.3 Gated Latches, 7.4 Edge-Triggered D Flip-Flops, 7.5 Edge-Triggered JD Flip-Flops, 7.6 Edge-Triggered T Flip-Flops, 7.7 Timing Parameters. Chapter 8 Introduction to Programmable Logic Architectures: 8.1 Programmable Sum-of-Products Arrays, 8.2 PAL Fuse Matrix and Combinational Outputs, 8.3 PAL Outputs with Programmable Polarity, 8.4 PAL Devices with Programmable Polarity, 8.5 Universal PAL and Generic Array Logic, 8.6 MAX7000S CPLD 8.7 FLEX 10K CPLD. Chapter 9 Counters and Shift Registers: 9.1 Basic Concepts of Digital Counters, 9.2 Synchronous Counters, 9.3 Design of Synchronous Counters, 9.4 Programming Binary Counters in VHDL, 9.5 Control Options for Synchronous Counters, 9.6 Programming Presettable and Bidirectional Counters in VHDL, 9.7 Shift Registers, 9.8 Programming Shift Registers in VHDL, 9.9 Shift Register Counters. Chapter 10 State Machine Design: 10.1 State Machines, 10.2 State Machines With No Control Inputs, 10.3 State Machines With Control Inputs, 10.4 Switch Debouncer for a Normally Open Pushbutton Switch, 10.5 unused States in State Machines, 10.6 Traffic Light Controller. Chapter 11 Logic GateCircuitry: 11.1 Electrical Characteristics of Logic Gates, 11.2 Propagation Delay, 11.3 Fanout, 11.4 Power Dissipation, 11.5 Noise Margin, 11.6 Interfacing TTL and CMOS Gates, 11.7 Internal Circuitry of TTL Gates, 11.8 Internal Circuitry of CMOS Gates, 11.9 TTL and CMOS Variations. Chapter 12 Interfacing Analog and Digital Circuitry: 12.1 Analog and Digital Signals, 12.2 Digital-to-Analog Conversion, 12.3 Analog-to-Digital Conversion, 12.4 Data Acquisition. Chapter 13 Memory Devices and Systems: 13.1 Basic Memory Concepts, 13.2 Random Access Read/Write Memory (RAM), 13.3 Read Only Memory (ROM), 13.4 Sequential Memory: FIFO and LIFO, 13.5 Dynamic RAM Modules, 13.6 Memory Systems. Appendix A Altera UP-1 User's Guide. Appendix B VHDL Language Reference. Appendix C Selected Data Sheets. Appendix D CMOS Handling Precautions. Appendix E EPROM/ROM Data for a Digital Function Generator. Appendix F Answers to Selected Odd-Numbered Problems. US $0,00 verzendkosten voor elk extra in aanmerking komend object dat u koopt van discover-books.